Gaiters keep the bottoms of your trousers/legs dry when it’s wet, or when you’re walking over boggy ground or through small streams. If it’s a nice warm day with little chance of rain, leaving your gaiters at home will be no issue. But if it’s been raining, take gaiters. Good gaiters clip to the front of your boot and strap under the sole so prevent them riding up over the top of your boot. Fitting gaiters for the first time is something to be done at home rather than in the time immediately before starting a walk. The straps or laces that secure the gaiter to the underside of your boot will need to be adjusted for your boots, and when you’ve done this once, that’s it. When you take the gaiters off, unzip but keep the straps fastened and remove the gaiter backwards away from your foot. Next time you put them on, just place your heel over the strap, then zip up as usual. This approach means that you don’t have to constantly fasten and unfasten the straps, which saves time and keeps your hands free from end of walk mud! Sheep/deer ticks sometimes carry lyme disease, which is a parasite that can cause long lasting neurological disability, and it is in the open countryside and sides of mountains that the ticks await your brushing past them. Aside from wet weather, gaiters can protect the susceptible area of your leg from ticks. Your calves do sweat, and the inside of your gaiter can trap condensation, which is why many gaiters are made of breathable fabrics such as Gore-tex. There’s little point keeping the water out only to get caught out by condensation falling into your boots, albeit not as much as walking through wet grass. 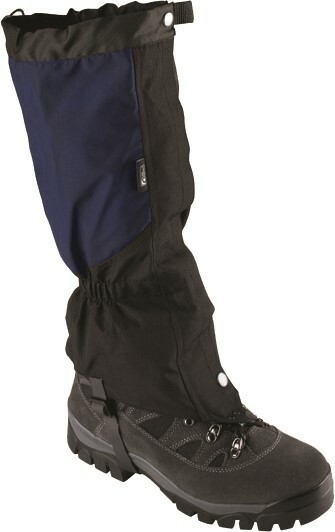 Most gaiters come with a top drawcord to allow tightening around the calf. Be sure to tuck in the extra cord/elastic so prevent getting caught by the gaiter strap fasteners of your other foot. Once you have your straps correctly fitted, cut them down to size with scissors, leaving only a little extra strap. This will prevent the loose end from getting caught in the drawcord of the other leg, standing on it, or anything else for that matter. Many years ago, my mate Jim and I had walked the South Glen Shiel ridge in the Highlands, 7 munros in a day, then wild camping. 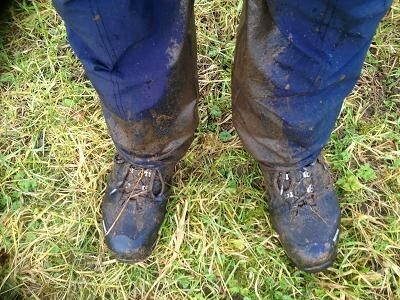 To keep weight down, I left various bits of kit in the car, including my gaiters. On the first day there was no issue as it was warm and we were high on the ridge. Over night the rain came down and when we set off walking up Saileg in the morning, it wasn’t long before the ankle high wet grass had deposited enough water on my lower calves for it to gradually seep down my leg and into the top of my boots. Within 30 mins my Gore-tex booted feet were soaking, and it wasn’t even raining. We both walked all day with wet feet, over 3 munros to do to get back to the car. If only I’d have taken my gaiters!